Photo of the Eraser Primary Belt Cleaner System, installed at the customer’s brickworks premises in Golden Grove, South Australia. The customer company was founded in 1908 and today is well-established as a major player in the brick industry. Their new brick superplant located near Golden Grove, South Australia, uses the latest high-tech automated controls and a high-efficiency kiln to achieve energy savings of 30 percent over previous technology. 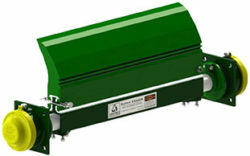 The plant is water self-sufficient, has low emissions and operates on zero waste. With more and more companies considering productivity improvements, waste reduction and containment of materials spillage in the production process, our customer was focused on minimizing all waste around the conveying of the wet clay. Previously they operated without any primary belt cleaning system. As a result, clay carryback and material spillage would occur along the conveyor, with build-up forming on the return rollers. This could cause belt mistracking and expensive belt edge damage. Extra maintenance and clean-up costs were often required. 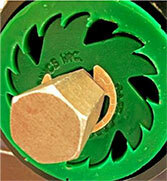 Close-up photo of the Eraser Primary Belt Cleaning System’s self-tensioning Safe Torque™ polyurethane ratchet.